Stop me if you’ve heard this one before, but Urban Meyer is stepping down from his head coaching gig, in part because of his health and in part because he wants to spend more time with family. He even might consider doing some TV! So obviously the only thing to do now is speculate on where he’s going to coach next. USC? Notre Dame? Auburn? North Dakota State??? This morning’s Yahoo Sports report (Meyer-sympathetic enough to safely assume it’s coming from Meyer himself) says Meyer will coach one last game for Ohio State, the Jan. 1 Rose Bowl against Washington, before handing the reins to Ryan Day, the 39-year-old offensive coordinator who ran the team during Meyer’s suspension for mishandling and potentially covering up.the domestic violence allegations against assistant Zach Smith. A simultaneous report from Cleveland.com dwells on Meyer’s health problems. He had surgery in 2014 to treat a congenital cyst in his brain, but the headaches (potentially stress related) have returned at times in recent years. It’s all very reminiscent of Meyer resigning as Florida head coach in 2009 due to chest pains, returning the next season, then retiring in 2010 and sitting out one full season before joining the Buckeyes. Meyer’s time in Columbus has been a success. In seven seasons the Buckeyes have gone 82-9, including 54-4 in conference play. They won a national title in 2014 and have three Big Ten championships, and, not for nothing, have gone 7-0 against Michigan. 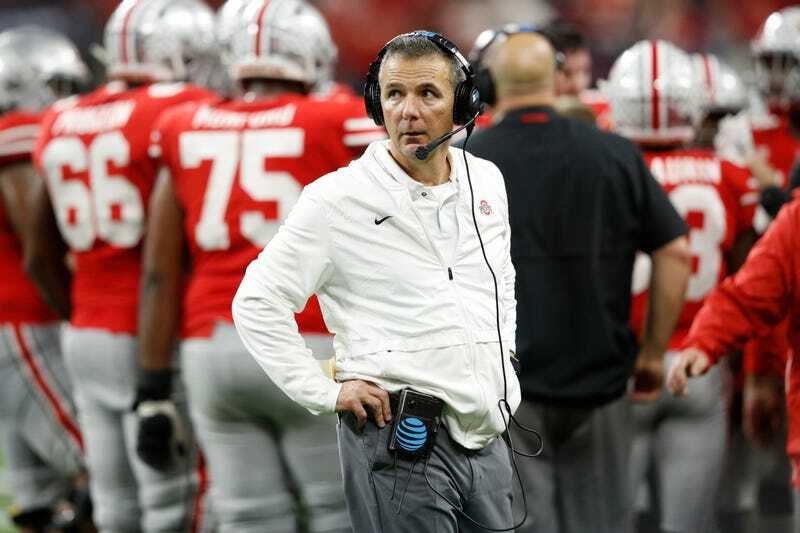 But Ohio State has failed to make the College Football Playoff two straight years after getting blown out 31-0 by Clemson in the 2016–17 Fiesta Bowl. So here we go again.